Here’s another example of what a professionally-written legal blog post looks like. Other Myers Freelance law blog samples include an article on bail, for criminal defense attorneys, child support modifications, for divorce attorneys, the EB-JOBS Act, for immigration lawyers, and an article on SR-22 insurance, for DUI-defense attorneys. This sample is an evergreen blog post for a personal injury attorney. It explains what to do after a car accident involving a pedestrian. It’s a popular statistic to know: More people die crossing the street than in plane crashes. The surprising part is that it’s not even close. In 2010, 828 people died in plane crashes, a total 13% higher than in 2009. 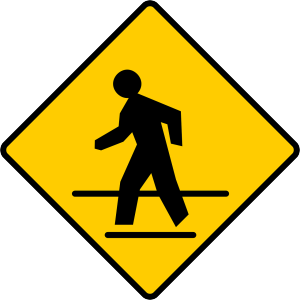 The same year, the National Highway Traffic Safety Administration found that 4,280 pedestrians were killed. Another 70,000 were injured. Those are some startling numbers: Pedestrians were 5.17 times more likely to die than air travelers. With pedestrian injuries so common, it becomes important to know what to do if you’re in a car accident that involves a pedestrian. It can make the difference between not only life and death, but also how much you’re liable for in the court case that follows. There’s no question that the first thing to do is make sure everyone is alright. If the accident is serious and there might be injuries, call 911. Locate nearby street signs or building addresses so you can give the dispatcher an accurate description of where you are. Tell them simply that there has been a car accident involving a pedestrian, where it happened, if there are injuries, and how serious they seem. After making the call, the important thing to do is to make sure everyone is safe until emergency personnel reach the scene. Under absolutely no circumstances should you leave the scene of the accident, especially if there are injuries. This can lead to criminal charges for hit and run. Once emergency personnel arrive and things begin to calm down and come under control, people might start talking about what happened. Don’t talk about it. This is the point in the accident that emotions come flooding back, and could make you say things that you don’t mean. If you say that it was your fault – even if just to comfort someone at the scene – this admission could come back to haunt you in the court proceedings. Instead, spend time making note of who was present at the scene, including those involved in the accident, any witnesses, and police officers and first responders. Note the injuries and property damage. If you have a camera, take lots of pictures – they may be used as evidence. Soon after the accident, you’ll need to report it to your insurance company. Be careful with what you say. While all insurance companies pride themselves on their “comprehensive coverage” before an accident happens, that all goes out the window once they might have to pay. Remember: Insurance companies are in business because the premiums they take in are more than the coverage they pay out. Keep that in mind if your insurance company offers a settlement. Whatever settlement an insurance company initially offers is likely way below what you should be getting. Call our personal injury attorneys before taking a settlement offer by an insurance company. They’re almost certainly trying to get out of the situation while paying as little as they can, leaving you with serious medical bills. This post ranks well for long tail searches related to pedestrian accidents and injuries, while also providing the kind of relevant and useful information that people want to read. Both of these are huge factors in how a blog post helps a site’s search engine optimization (SEO). The post also ends with a strong call to action. By creating a scene that the reader can relate to, and walking them through the process of a pedestrian accident, the post can culminate with the phone call to the insurance company. This is the time when legal issues come to a head, and when having a personal injury attorney is crucial, providing a smooth segue into the call to action. These are the benefits that you can expect from a law blog post written by Myers Freelance. Get in touch with us to start a legal blog for your firm, and follow us on Facebook and Twitter for updates, writing tips, and blog post ideas.